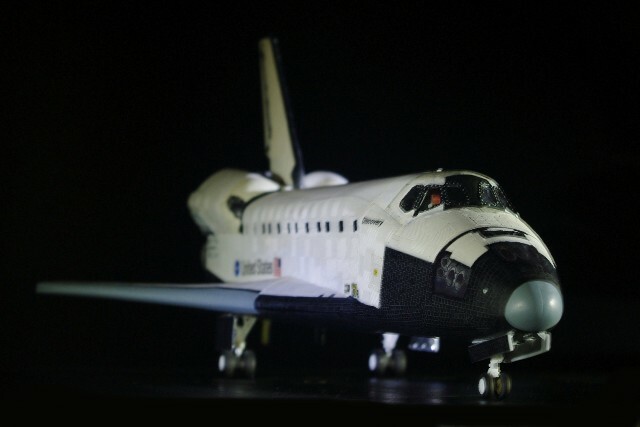 This was the fourth 1/72 scale Orbiter I have constructed since the beginning of the Space Shuttle Program in 1981. 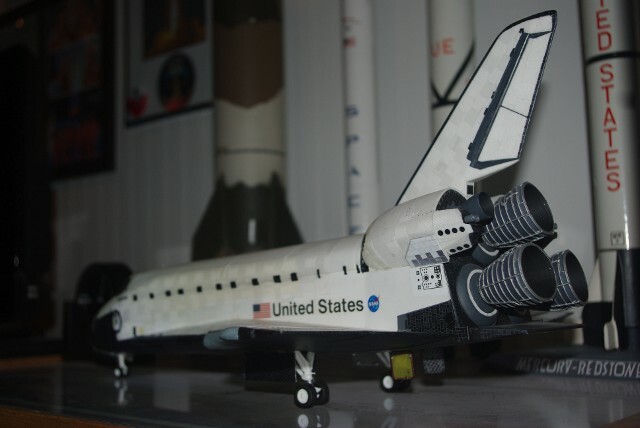 It was built using four detail items I had not previously employed - specialized Thermal Protection System "tile decals," made by Ed Bisconti in Suburban Chicago and sold on eBay; special Shuttle Detail Decals, which included NASA "meatball" decals also made by Ed; Space Shuttle instrument panel decals made by Ed and the 1/72 scale Space Shuttle Main Engine set from Real Space Models of Tallahassee, Florida. 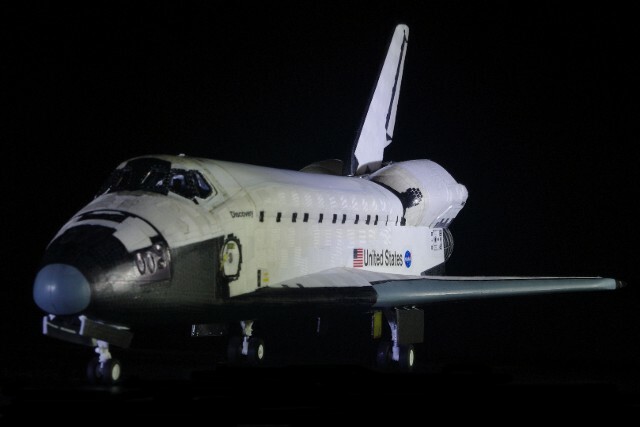 The Orbiter was liveried set to commemorate the flight of STS-133, the last flight of Discovery, which we attended at KSC on February 24, 2011. 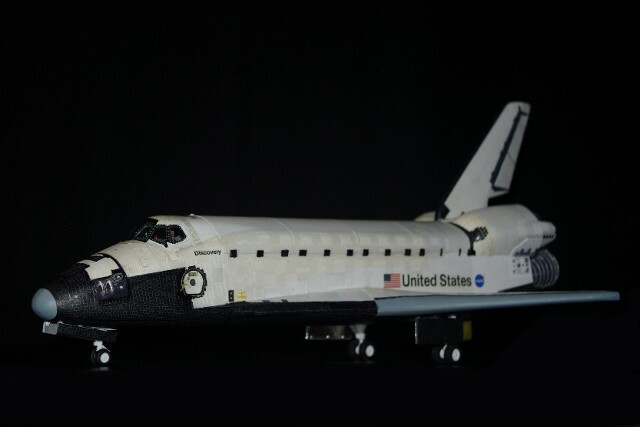 The model is post-landing, with the gear "down & locked" but the ET Umbilical Doors are still closed. 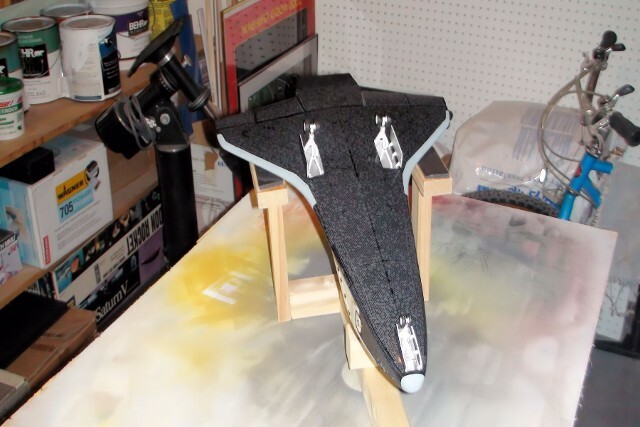 This photo was taken late in the assembly process, after completing the cockpit interior and the initial painting of the white main color and the German Grey area for the "black tiles" as recommended by Ed Bisconti. Upon applying the decals, I can see why this color was chosen. It just dark enough to set the tone, but light enough to allow the edge detail of each tile to show. The tile decals are just dark enough to work with the German Grey and appear to run in various degrees of darkness, simulating the various shades of the actual applied and weathered TPS tiles. 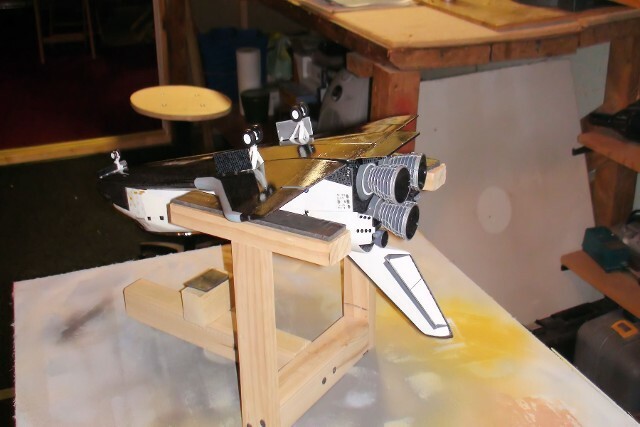 The wooden cradle was used to support the model during bottom tile decal work. This view shows the excellent detail of the Real Space SSMEs, after attachment to their locations. 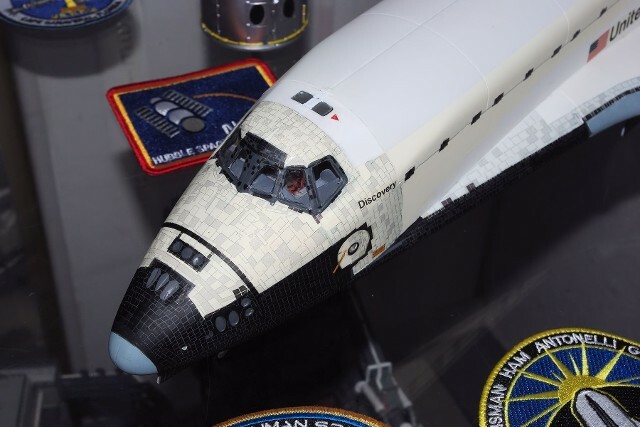 The upper surface "white tiles" of the TPS were also part of Ed's decal set. These are a little tricky to apply, as there are numerous sections and curves to negotiate. The surface of the Orbiter beyond the white tiles is covered by Thermal Blankets in real life, but there are no decals just yet to replicate them. A view of the completed underside, prior to "dull coating." A satin-finish lacquer was applied to the entire surface, both to protect the decals as well as remove the "shine" from the surface and make the tiles look more realistic. The front windows were installed after dull-coating in order to retain clarity. There were also "perimeter decals" to apply around the window edges. After they were placed and dried, they were coated with brush-applied dull-coat to blend them to the rest of the finish. 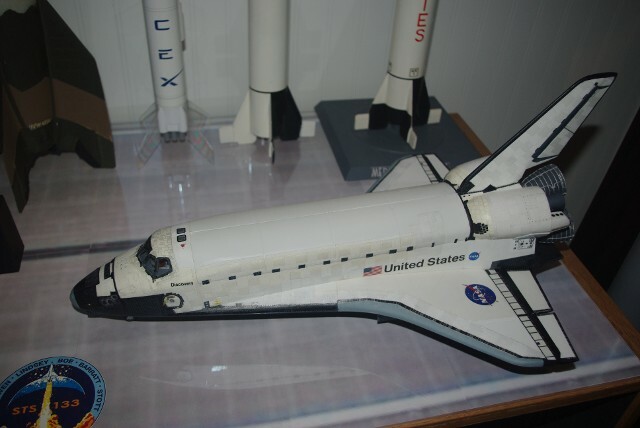 The completed Discovery on display. Close-up of the Real Space SSMEs. The OMS Engines are also part of the Real Space engine set. 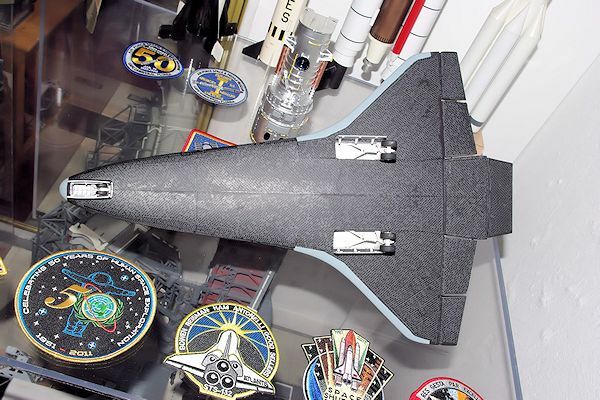 The lower edge of the vertical stabilizer was "bobbed" to create the Drag Chute location used on the Shuttles, which was not part of the Monogram tooling. Sheet styrene was used to flesh in these areas. The underside after dull-coating shows how much more realistic the decals look than when they were glossy. Landing Gear Well colors were patterned from photos taken of the Discovery while in the Orbiter Processing Facility. The originally-used "white tile decals" continued to vex me. They only covered the front and sides of the nose - nothing for the mid-body or the lower edges of the cargo bay doors. and while this white-tile-dependent treatment might be appropriate for Columbia, or even Challenger, they just didn't look right on the later Orbiters. 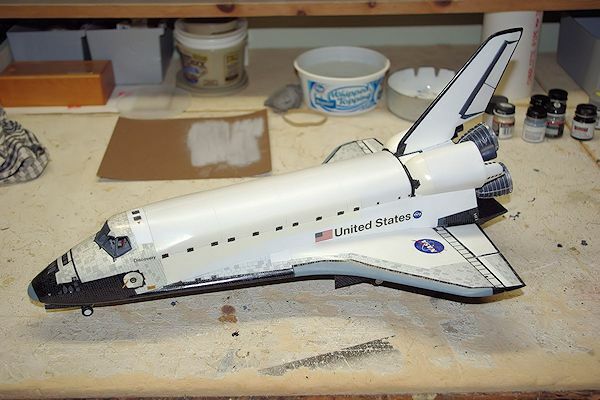 I removed all of the Bisconti white tiles from the nose, except those around the upper cockpit area, and then set about applying the FRSI "tape" approach I used on the Endeavour and Atlantis builds. Third-time's the charm - we're getting pretty good at it now. 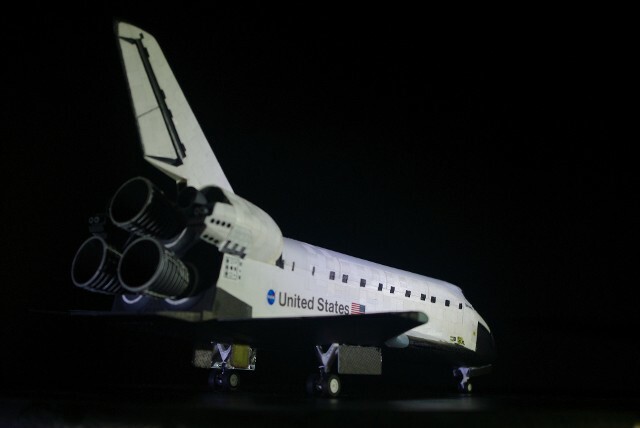 Since I was not able to "open up" the forward RCS jets or the Star Trackers on this model as we had on the other two more recent builds (ripping open the bay doors and forward section of the model was not a good option), I decided to use photos of Discovery I had taken at NASM's Udvar-Hazy Center to create good looking RCS nozzle detail panels printed onto white decal stock, and integrate them into the black Bisconti decals. The OMS pods were completely re-done, using strips of re-scaled War Birds white tiles and the FRSI tape process. 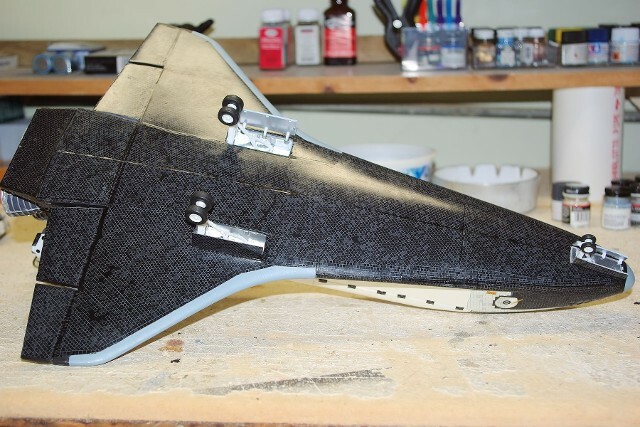 The additional lower OMS panels above the Tail Umbilical Connection Plates were also added. Cabling was added to the main landing gear, as well as a set of ET Umbilical Doors in the open position. The ET Door interior details were pulled from NASA photos of the Discovery being prepared in the VAB for stacking for the STS-133 mission. The images were printed onto white decal stock and applied to the door interior surfaces. Likewise, I did the open ET Umbilical Connections on the underside of the Orbiter, within the defined area of the Umbilical Doors, also using the same NASA photo and white decal stock. Since we did not re-open the nose of the model, the AMP Shuttle Window set could not be installed as it was intended, so I had to improvise. The original paint and decal laden Monogram windows were removed and a new unpainted Monogram window set was installed. The outer-most "frame" from the AMP window set was first painted flat black, then placed onto the outer surface of the Monogram windows. The surrounding areas were built-up slightly using Testor's Clear Window Cement and then painted with a custom-mixed "off-white" color to match the color of the remaining Ed Bisconti white tile decals. Bare Metal Chrome foil was added to the interior surfaces of the Main Gear doors. 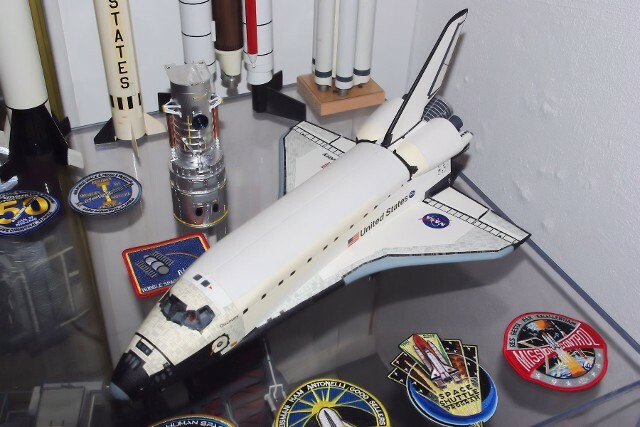 All of the Mid-Body detail decals that were lost when the Bisconti white tiles were removed were replaced with Real Space 1/72 Shuttle decal components. Here we stand with the "real deal" - Orbiter Vehicle 103 - Discovery - as we saw her at the Udvar-Hazy Center of NASM in Washington, DC in January of 2013. 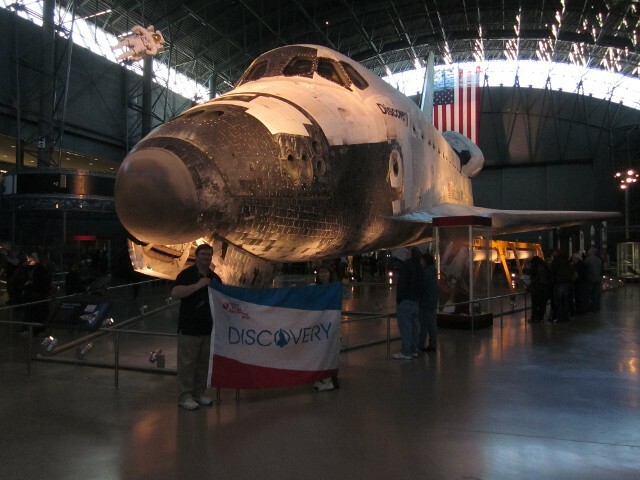 The Discovery flag was one of those flown at KSC during the last launch of STS-133, Discovery's last launch, which we attended on February 24, 2011. 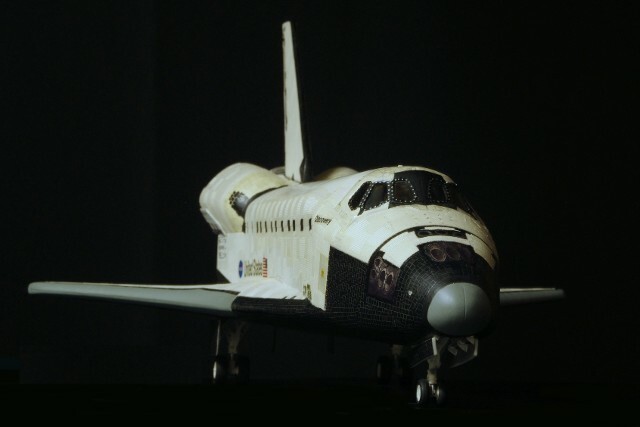 Thank you, Discovery, for your years of faithful service to the Nation. Thank you, Ed Bisconti, for the marvelous Shuttle Tile Decals. Thank you, David Maier, for giving me "new eyes" to see my spacemodeling through. 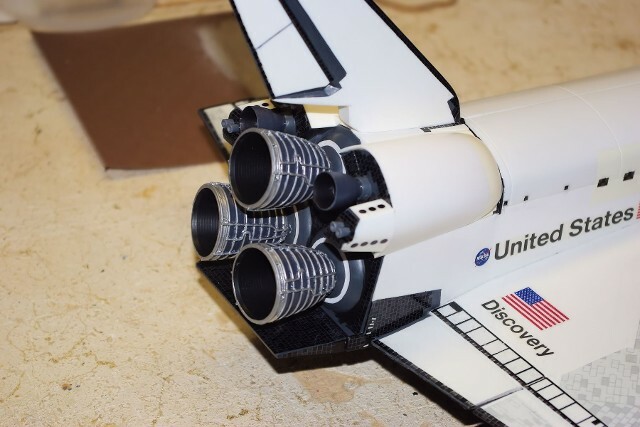 To order the Space Shuttle Tile Decal Sets seen here, or obtain a copy of the FRSI Replication Process Guide free of charge, click here to get to our Space Modeling Products page!